Hyundai i20 | What Car? The Koreans aren't enjoying the recession any more than the rest of us, but they're doing better than most. It has given them a chance to play catch-up with companies not so well off for development funds, and led to scrappage incentives that, combined with low prices, have made Korean cars a lot more attractive. A new clientle has, therefore, discovered that cars such as the i20, far from being Industrial Revolution relics, really aren't so bad. The top-spec 1.4-litre Style has a respectable 99bhp petrol engine; it seats five with reasonable ease; and for 11,200 without the scrappage bonus, it provides 16-inch alloy wheels, climate control, powered windows and mirrors, six airbags, anti-whiplash head restraints and a five-year warranty. For the 2010 model year, which means any time now, you also get stability control. How about that, Ford? Why, then, aren't we all rushing to buy one? The answer largely lies in the cultural differences between East and West on what constitutes style. There's nothing offensive about the i20, but it would certainly have benefited from the attentions of a designer such as Ford's Martin Smith, or his counterpart at Vauxhall, Mark Adams. The same is even more true of the interior. 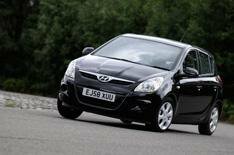 Hyundai has discovered soft-touch plastics and metallic-effect paint, but it is still self-conscious about using them. Elsewhere, there are real aberrations, such as the red inserts in the black trim of our test car, which makes it look like one of those friction pads designed to get cat fur off your clothes. The driving position is more MPV than supermini, as is the broad dashboard. You feel like you're perched on a stool, looking over a Formica table. Surprisingly, though, you don't sway around or feel at risk of falling off when driving. The chassis just needs a bit more finesse and some decent tyres in place of the squealy Hankooks. While we're at it, more low-down pulling power, a slicker gearshift and extra sound-deadening wouldn't go amiss. The thing is this: the Koreans are aware of these shortcomings and have an aggressive development programme in hand to counter them. So those of you who have come on board because of the scrappage scheme can rest assured that, by the time the dealer calls to see if you're interested in a trade-in, a car even closer to European standards will be waiting.